As we reflect on 2017 with an eye to 2018, we are struck by the continued progression of clean technology, despite the negative sentiment of a year ago. While concerns were not baseless, much was made of the negative prospects for clean tech and new energy given an incoming Administration that denounced clean technology solutions in favor of fossil fuels, with a focus on coal power promotion. As the Trump Administration attempted to limit EPA oversight and walked away from a global solution to combatting climate change with the Paris Climate Accord, disruptive clean tech solutions continued to take share from old-line, traditional energy sources. There was talk of placing tariffs on solar module imports, scaling back solar incentives in the form of tax credits, and limiting federal rebates for EVs. While some of these concerns could materially impact portions of the clean tech sector, such as solar module tariffs, we manage the Essex Environmental Opportunities Fund with a focus on technologies that are commercially viable in the absence of government incentives. As we begin 2018, the global direction for clean tech is evident, continuing to stride in forward fashion. Since the Trump Administration denounced the Paris Climate Accord, 250 U.S. cities, 12 states and 300 companies representing over $6.5 trillion in market value have set climate targets, with more than 100 companies having committed to run their operations solely on renewable energy. The states, cities and companies formed the U.S. Climate Alliance and the Mayors National Climate Action Agenda to promote economic progress alongside climate action. Just prior to year-end, the U.N. published a report stating that the world is indeed de-coupling emissions from economic growth. Clean tech investment leads to economic growth, job creation, and a cleaner planet, which is why there is so much support for climate solutions. While it looks like the Federal EV rebate is in place in the current tax package, EV growth would remain at 30% globally in our opinion if the rebate were disbanded because clean tech disruption occurs globally, centered in the emerging markets. 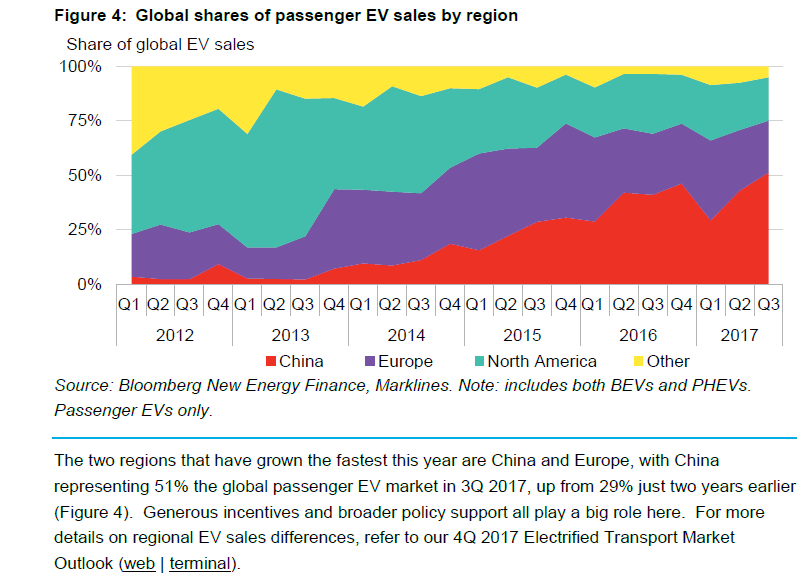 EVs only equate to 2% of global auto sales according to Bloomberg New Energy Finance (BNEF), but the rate of growth is considerable, with China driving demand as the chart below illustrates, given their horrible urban air pollution resulting on bans for internal combustion engines (ICEs). As we mentioned earlier this year, disruptive technology does not care who is in Washington. With successful and scaling clean technologies, more can be achieved with less. These technologies are adopted because they enhance the quality of life and save money, whether on a factory floor with robotics, on the farm with precision agriculture applications or in a city with traffic and energy management systems. Each of these solutions is represented by the Fund, achieving economic growth with enhanced productivity and lower environmental impact. We look forward to discussions on clean technology climate solutions as 2018 unfolds. This commentary is for informational purposes only. It does not constitute investment advice and is not intended as an endorsement of any specific investment. The opinions and analyses expressed in this commentary are based on Essex Investment Management LLC’s (“Essex”) research and professional experience, and are expressed as of the date of its release. Certain information expressed represents an assessment at a specific point in time and is not intended to be a forecast or guarantee of future results, nor is intended to speak to any future periods. Accordingly, such statements are inherently speculative as they are based on assumptions that may involve known and unknown risks and uncertainties. This does not constitute an offer to sell or the solicitation of an offer to purchase any security or investment product, nor does it constitute a recommendation to invest in any particular security. An investment in securities is speculative and involves a high degree of risk and could result in the loss of all or a substantial portion of the amount invested. There can be no assurance that the strategy described herein will meet its objectives generally, or avoid losses. Essex makes no warranty or representation, expressed or implied; nor does Essex accept any liability, with respect to the information and data set forth herein, and Essex specifically disclaims any duty to update any of the information and data contained in the commentary. This information and data does not constitute legal, tax, account, investment or other professional advice. Essex being registered by the SEC does not imply a certain level of skill or training.